A foodie in Stellenbosch is as happy as a pig in mud. With more options than even the cuisine cornucopia of Franschhoek, Stellenbosch’s fine dining scene makes for one delicious restaurant bucket list. We’ve narrowed down the best of the best to get you started. This selection comprises all the Stellenbosch restaurants that made the cut for the 2019 Eat Out 500, the list of best restaurants in the country as rated and reviewed by our panel of critics for the 2019 edition of Eat Out magazine (on sale now). But we know there are many more great spots in the area. Please tell us about your favourites in the comments at the end! 96 Winery Road has been serving guests rustic flavours and generous portions for decades. Tuck into an excellent starter of steak tartare (hand-cut with all the trimmings) or opt to up it into a main course with chips for the serious carnivore. Another excellent starter is the steamed mussels with fresh cream, plenty of garlic and gremolata. The Hollandse pepper fillet has a long line of devotees who come for the rich cream and brandy sauce, as well as the flambeing at the table. There’s also no tiring of the fabulous duck-and-cherry pie. Run by father-and-son duo Roberto and Nicol Bottelo, this restaurant is the real deal when it comes to simple, authentic Italian fare. The classic starters include panzanella, carpaccio and bruschetta. The thin-based pizzas are baked in a wood-fired pizza oven, creating deliciously crunchy charred edges. The specials board could have spaghetti with vongole, or you might find your favourite dish and stick to it for life, like the Mafiosa with tagliatelle – a simple yet punchy combination of garlic, capers, chilli, anchovy and onion. End with the affogato or tiramisu. This burger haven by Bertus Basson offers quality food on the run. Highlights include the 200g free-range beef burger with a fluffy golden brown bun, juicy patty and lettuce, tomato, onion, pickles and double cheese. (If you want more, add bacon, smoked chilli sauce or Melrose and biltong). Enjoy with sides of hand-cut potato chips, onion fritters and crispy onion rings, or have an ‘uitpakslaai’ – a take on the traditional Afrikaans salad with creamy dressing and layers of tomato, onion, peas, lettuce and olives. And the best part? You get a free soft-serve ice cream with every burger bought. The food here is fuss-free and honest, with bistro-inspired dishes of soups, hearty salads and roast meats. The garden salad is a simple celebration of seasonal veggies and leaves tossed in a delicate dressing. Dishes change depending on the season, but a couple of iconic ones like the burger made with Farmer Angus’ grass-fed beef and bacon – served with slaw and hand-cut chips – will always be there. Another perennial dish is the deeply satisfying chicken-and-mushroom pie. The homely desserts include apple-and-ginger pudding and a chocolate fondant. Eike is known for serving local flavours with seriously unexpected twists. Canapes such as the wildebeest and macadamia wrapped in a paper-thin slice of celeriac set the quirky tone. 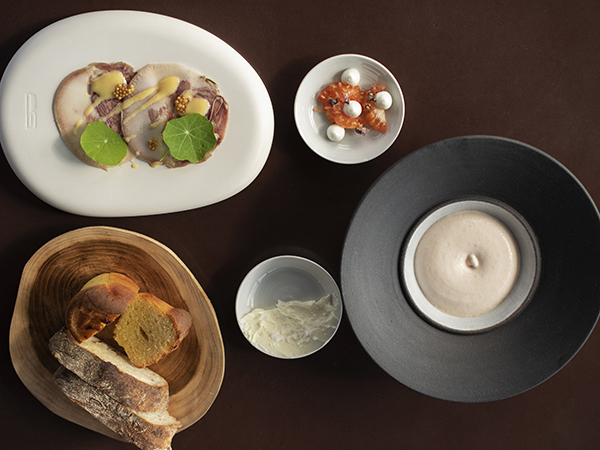 The bread course includes an opsitkers, a beef fat candle that melts into a dipping puddle. 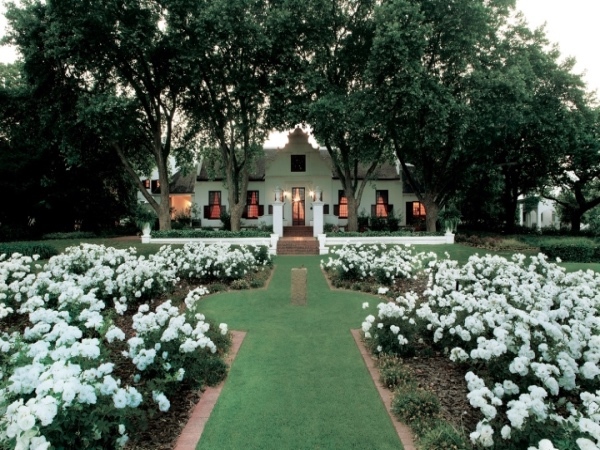 Other highlights include the shaved kohlrabi topped with slivers of lamb biltong; an unusual bobotie of spiced meat tartare topped with raw sweet potato ‘ravioli’; the seared fillet of carpenter with waterblommetjie tempura and oysters; and the Plankievleis, which celebrates slicing braaied meat at the fireside. Finish off with the ‘What Happened in the Garden of Eden’ dessert, which includes a white chocolate apple that cracks to reveal an apple compote and Cremora mousse. The colourful interior at Eike Restaurant. Photo supplied. The beef at The Fat Butcher is pasture-reared, grain-fed and perfectly prepared. Signature steaks include The Grosvenor fillet with chocolate, chilli and beer. There’s also excellent lamb rump, pork ribs and spatchcock chicken to enjoy with sides like sweet potato mash, braaibroodjies, onion rings or fries. This small Japanese-style eatery consistently provides fantastic food prepared with passion and dedication. 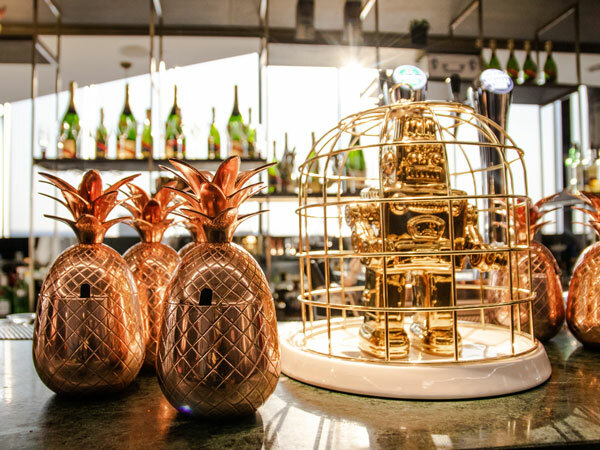 The menu includes individual portions and platters and they also have a specials board featuring items like prawn dumplings and soft-shell crab. Highly recommended: the pork ramen, which comes with a generous portion of dark fragrant broth with noodles, mushrooms and aromatics. Equally as good is the deep-fried crispy whitebait served whole and with a punchy ponzu dipping sauce. Start with the signature tuna tataki flavoured with fermented garlic and curried beef laksa with langoustine dumplings. The main course features the exquisite signature vindaloo of local seafood, combining steamed shellfish and line fish enhanced by an apple-and-celery dressing. Vegetarians will enjoy the smoky textures of the cauliflower, an exotic green mango salad and Thai green curry. For carnivores, there’s a spicy spin on sticky beef short ribs or Korean BBQ chicken with kimchi. Leave space for the signature Willy Wonka green tea and chocolate composition dessert. 🍽 Available for online bookings on the Eat Out app. A tuna tataki dish from Indochine. Photo supplied. The menu at Jardine may be small, but when you’re cooking highly seasonal food, that’s not a bad thing. Start with the springbok tartare with aïoli, walnuts, sourdough crisps and pickled onion. Highlights from the mains include herbed barley risotto with crumbed poached egg – it abounds with fresh, herbaceous flavours. But the pan-fried Mauritian sea bass with artichoke veloute, grilled artichoke and tangy shaved cauliflower is unmatched. A dish at Jardine Restaurant. Photo by Samantha Clifton. Joostenberg provides the option to sit in the restaurant or picnic on the lawn with goodies from the deli. 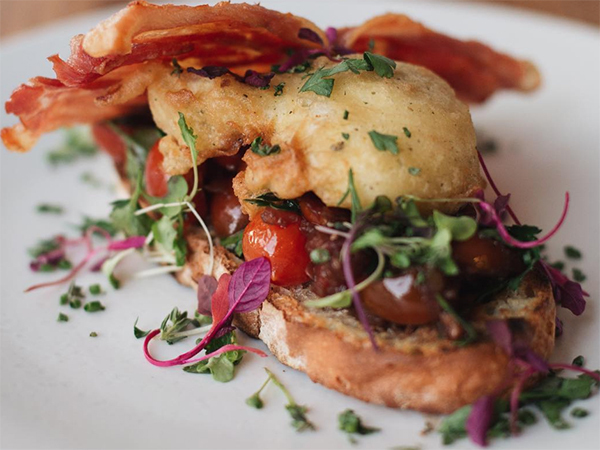 The breakfast menu includes the mouth-watering French toast with fynbos honey and bacon; or go big with the Frenchman’s – assorted cheeses, charcuterie, a baguette, a croissant and a financier. 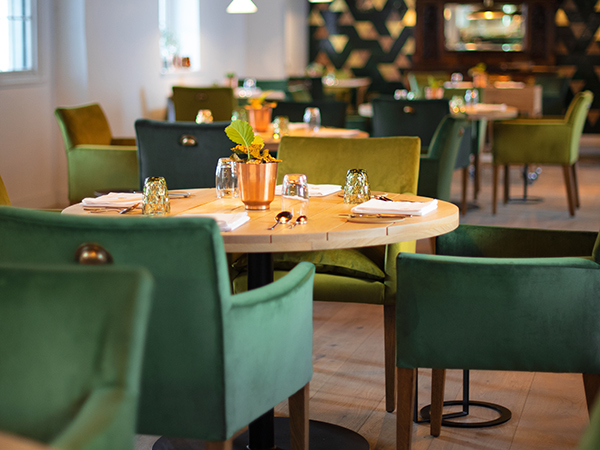 The lunch menu features a charcuterie plate with excellent farm bread; a croque monsieur; pan-fried line fish in a chenin blanc reduction; pork neck vindaloo; dry-aged rump steak; and the Joosten-burger with a fantastic ground beef rump patty. Dessert includes country-style staples like the dark chocolate mousse with crème anglaise. Go to Jordan for unwaveringly consistent gourmet fare in a postcard-pretty location. The three or five courses paired with wine allow you to acquaint yourself with Jordan’s food philosophy and head chef Kyle Burn’s delicate treatment of fine produce. Order the moreish organic golden beef fondue with potato gnocchi, purple kale and black pepper crumble. The tender and perfectly roasted Cradock springbok served with parmesan polenta, caramelised shallots and raw chard salad is an honest ode to the nation’s treasured venison. The lovely exterior at Jordan restaurant. Photo by Jan Ras. Kick off with the likes of fresh West Coast mussels in a white wine, coconut cream and chilli sauce, or opt for Asian-style grilled tuna with ginger and chilli, served with a saffron aïoli. For the less adventurous, there’s a grilled beef salad with piquanté peppers, cherry tomatoes and feta, and a vegetarian chickpea burger. The mains include chermoula-marinated lamb shank with mashed potato, steak with potato bake and carrot puree, and line fish with asparagus and lemon-butter sauce. Chef Maritz Jacobs creates exciting dishes with a strong South African influence. The winter menu includes starters like the charcoal-grilled octopus with curried squid and tartare sauce. It’s a firm favourite, as is the meltingly soft beef tongue with a sweet mustard mayonnaise. Highlights from the mains include oxtail with roast bone marrow, creamy polenta and garden vegetables. Vegetarians can opt for the linguine with oyster mushrooms, artichoke veloute, hazelnuts and black truffle dressing. For dessert, enjoy the pineapple crumble with vanilla ice cream. 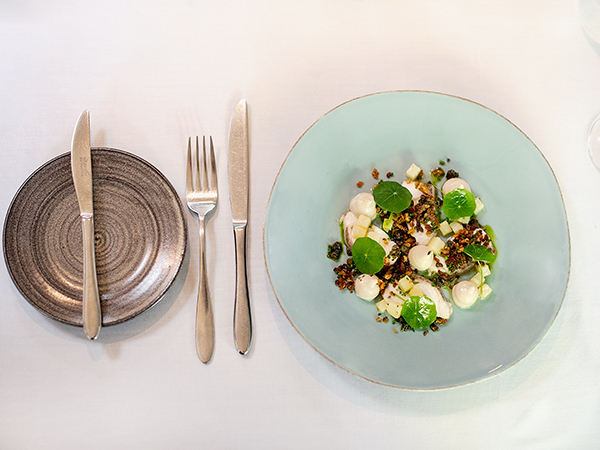 A beautifully-plated dish from Longridge Restaurant. Photo supplied. 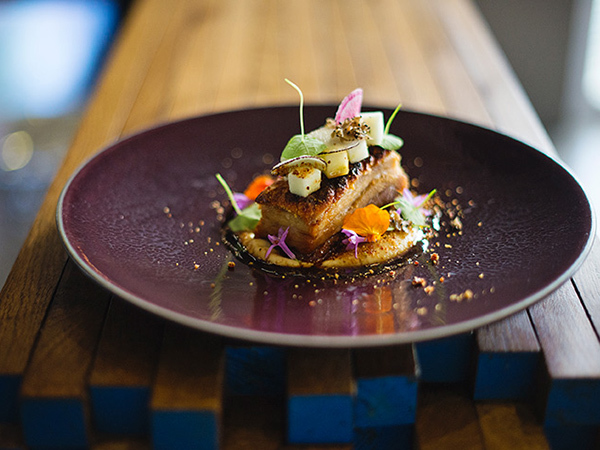 The new small plates created by chef Lucas Carstens blend modern cooking with traditional flavours of the Cape. Diners have the option to choose three, four or five small plates. Standout dishes include the fire-roasted octopus with kohlrabi and apple. The char on the octopus offsets the sweetness from the apple. 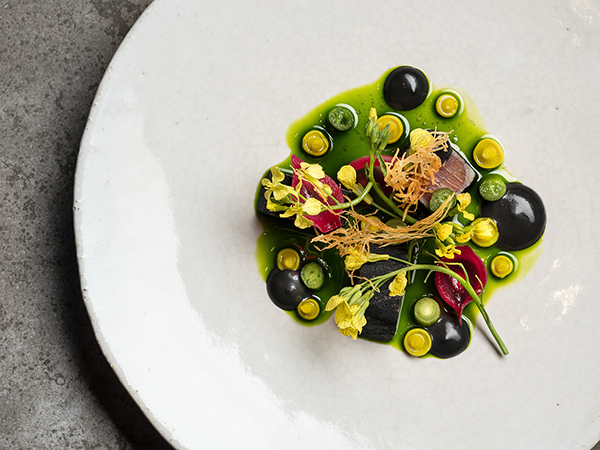 The lamb ‘staanrib’ with pickled waterblommetjies and lemon is a triumphant celebration of the Cape’s indigenous flavours. Makaron is right on trend with the beautiful and light guava, turmeric and melon dessert. A pork belly celeriac and apple dish from Makaron Restaurant. Photo Supplied. This eatery on a picturesque oak-lined street offers a thoughtful collection of beautifully presented delicious fare. Popular breakfasts include banana bread French toast with homemade blueberry jam, strawberries and cinnamon whipped cream. The lunch menu includes a crunchy and colourful harvest table, as well as interesting bowls, sandwiches, wraps and salads. Their take on Caesar salad includes lemony chicken strips and pasta served with a yoghurt-and-pecorino dressing, cos lettuce and kale. They also have an abundance of pastries, tarts and mini cakes on display, such as coconut slices or chocolate-and-almond cruffins. Oppie Dorp Restaurant and Wine Bar offers upmarket food in a relaxed environment. Light lunches include familiar favourites like hake and chips, a burger or the soup of the day. For dinner, try a starter of calamari with lemon butter drizzle and tartare sauce, or opt for the stuffed aubergine with mozzarella, olives and onions on a bed of reduced pomodoro sauce. Favourites from the mains include the slow-roasted Karoo lamb, or the line fish with sweet potato puree and stir-fried veggies. Other options include locally sourced venison, beef fillet, aged sirloin and pizzas. For a South African take on haute cuisine, choose between the three-course menu or six-course culinary tasting adventure. The nostalgic yet gourmet Kombuis pre-meal snacks include the Bo-Kaap Corner Shop, farmyard terrine and homely fennel-seed ciabatta. Other highlights include the summer dish of charred carpenter fish with tomato, salsa water, cucumber, macadamia, coriander and charcoal oil; and beef fillet with leek fondant, celeriac puree and smoked celeriac. Desserts include Overture’s orange soufflé with vanilla ice cream and chocolate mousse with mulled pears and naartjie. A modern spread from Overture. Photo Supplied. 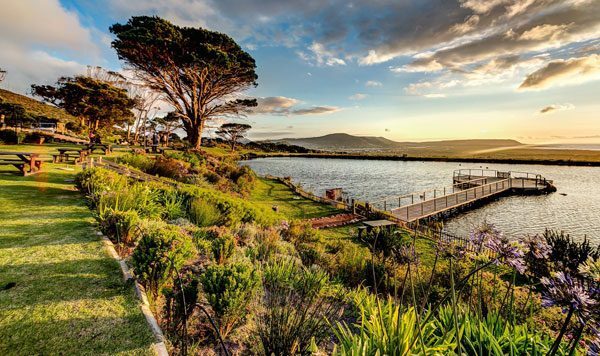 Rust en Vrede regulars swear by the six-course menu with wine pairing. The menu includes tuna, wild rice, and coriander; crown-roasted duck breast with broccoli, red cabbage, pistachio and cucumber; Wagyu brisket with sundried tomatoes, crème fraîche, red pepper and portobellini mushrooms; and chef Fabio Daniel’s interesting flavoured desserts, like the strawberries and meringue with balsamic vinegar. 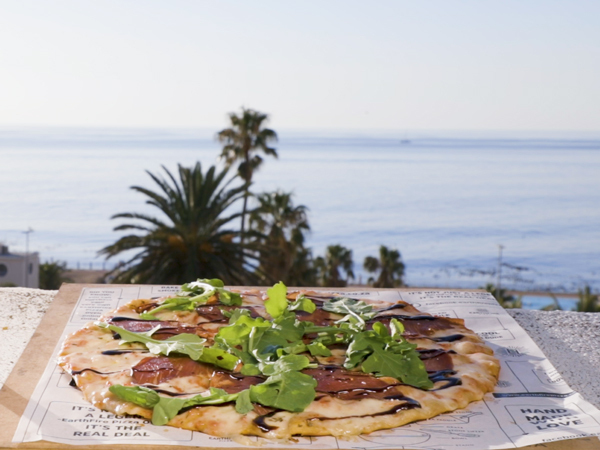 Sansibar’s wood-fired oven is at the centre of its bistro-style menu, which includes favourites like elongated flatbread pizzas with toppings like Parma ham with gorgonzola, caramelised onions and wild rocket. Starters consist of bistro classics like Caesar and Caprese salads, barbecue chicken wings or the gin-cured salmon salad. 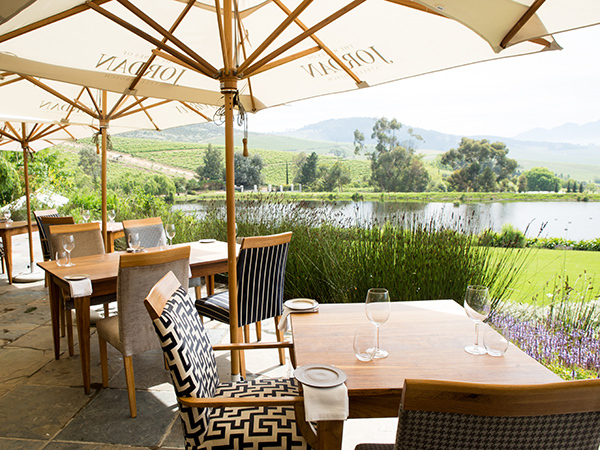 The wood-fired mains range from the Asara beef burger to glazed pork ribs and yellowfin tuna. They also have three platter options to share. Desserts include apple tarte tatin or gin mousse. Chef Bertus Basson’s trademark South African tastes pack a punch at this casual food-and-wine bar. 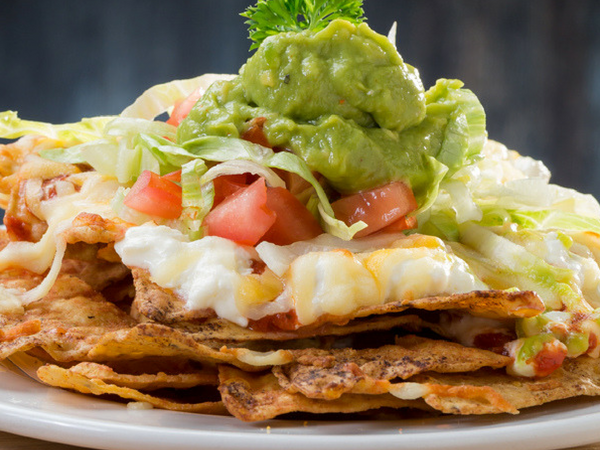 The substantial plates are made for sharing. Start with butter-roasted cauliflower with chimichurri, macadamia, baby onions and goat’s cheese. Other dishes include the pleasantly briny whole red roman, with a nasturtium paste adding pepperiness; Chalmar beef sirloin with crumbed mushrooms; smoked spicy soy pork belly; and a vegetarian dish of butter rotis with hummus and cheddar croquettes. Leave space for the homemade Peppermint Crisp King Cone dessert for two. 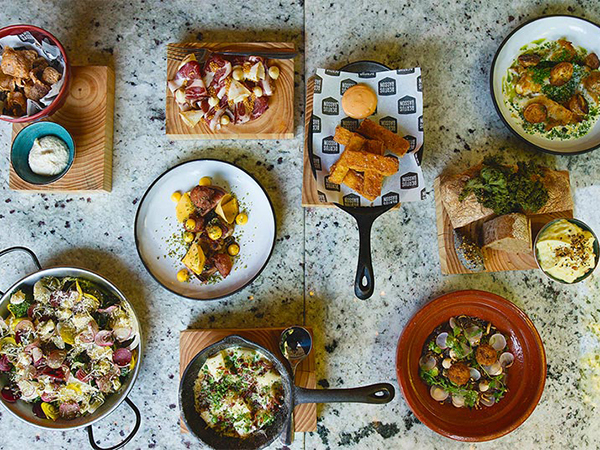 A family-style spread from Spek en Bone. Photo supplied. Stellenbosch Kitchen serves scrumptious breakfasts, lunches and dinners. Highlights from the starters include the Caesar salad, oven-grilled calamari tubes with chorizo and the earthy mixed-mushrooms risotto with truffle oil. Tuck into the Monster burger with spicy aïoli, onion marmalade, Healey’s mature cheddar and fries; the ale-battered hake with fries, mushy peas and charred lemon; or the restaurant’s signature Karoo lamb rack with herb crust. Dessert includes the classic raspberry mille-feuille and a dark chocolate fondant. This unassuming farm-to-table restaurant, currently run by Jess Shepherd and her husband Luke Grant, is changing hands in May and plans ahead are still to be confirmed. If it’s still operating under the duo at time of reading then you should make your way there for the fresh food. All veggies and herbs come from Jess and Luke’s own abundant garden, and every other ingredient is sourced from a nearby neighbour. It’s also because of this seasonality that Jess’s menu changes weekly. Starters could include a twice-baked cheese soufflé with a perfectly dressed garden salad or a tomato tart with heavenly pastry. For mains, look forward to slow-cooked lamb shoulder or beef shin with a potato bake. Desserts could be a perfectly jiggly panna cotta or a plum-and-frangipane tart. Everything comes sharing-style except the dessert. Terroir has become known for several iconic dishes – notably the prawn risotto and chef Michael Broughton’s wonderful dessert soufflés. 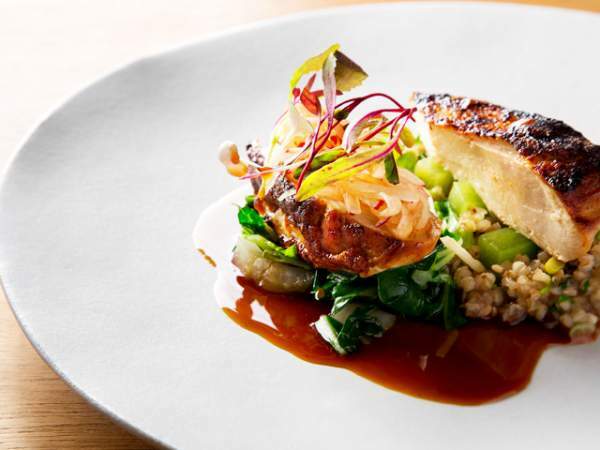 These are still on offer, but the seasonal menu holds other treats, like the Malay-style baby squid with smoked mackerel, aïoli and coconut or confit duck, roasted kohlrabi, rhubarb jus and carrot crumble. For dessert, try the soufflé of the day or vanilla tart with honey ice cream and almond crumble. Also ask about the trios of ice creams and sorbets that come in wonderfully inventive flavours. The Caesar salad is given a fresh twist, served with poached eggs and white anchovies. There’s also a selection of pizzas on the lunch menu. Try the generously topped margherita with buffalo mozzarella, tomato sauce and fresh basil, or the tender and flaky line fish served with sautéed seasonal greens and earthy bean puree. 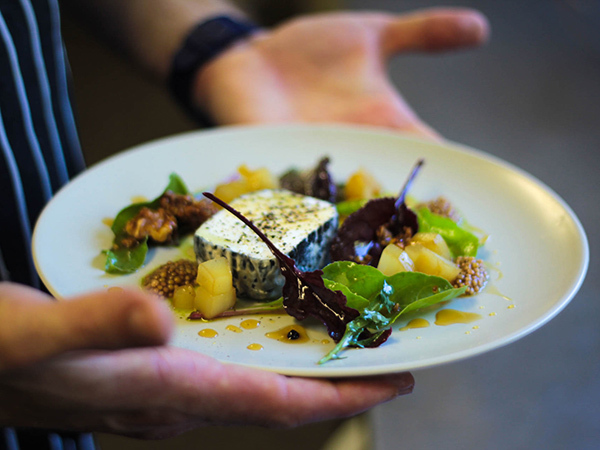 A dish prepared and served at Tokara Delicatessen in Stellenbosch. Photo Supplied. 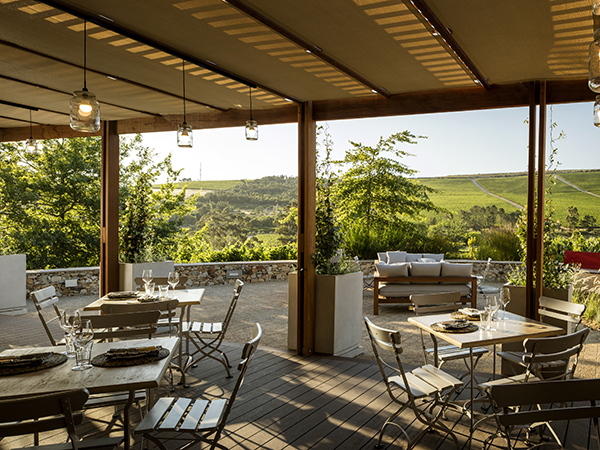 At the flagship restaurant on this gorgeous wine estate, award-winning chef Richard Carstens combines bold flavours with uniquely local ingredients (sometimes with Asian flair). The recommended four-course seasonal tasting menu boasts the likes of roast hake with cauliflower puree and a divine chardonnay mussel sauce. This is followed by umami mushroom ravioli with soft goat’s milk cheese. Braised lamb is complemented wonderfully by heerenbone puree and sweet poached quince. Finish off with a square of lemon cake accompanied by a very subtle olive oil ice cream. The Vine Bistro at Glenelly offers classic French-inspired bistro fare. Expect starters that change seasonally, like beef brisket consommé and pan-fried sweetbreads; and mains like red stumpnose with a bouillabaisse sauce or braised pork cheeks. Other dishes include the pork and pistachio sausage salad served with fresh, well-dressed baby greens; and the rabbit-and-mushroom casserole with polenta. For dessert, try the apple tarte tatin with calvados and apple sorbet, or the chocolate and sesame nougat glace with poached figs and dark chocolate sauce. 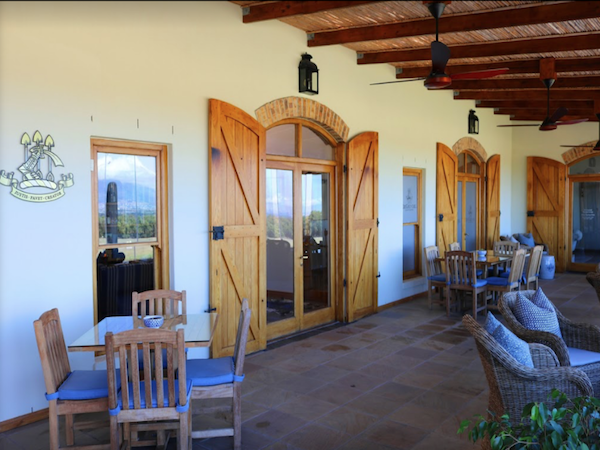 The outside seating with a view of the Winelands. Photo supplied. 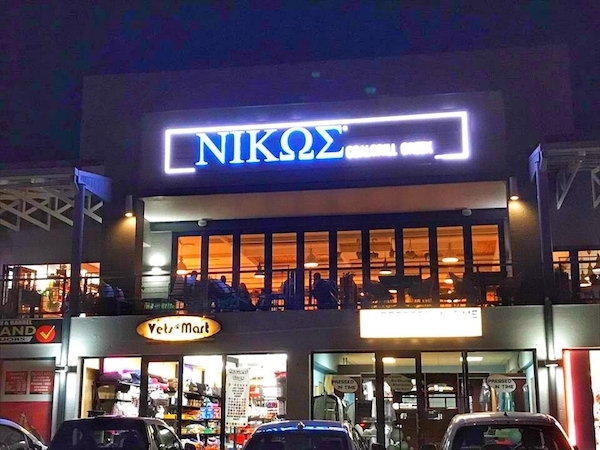 The following spots opened after the 2019 edition of Eat Out magazine went to print and have since been rated and reviewed by our critics. Hazendal’s fine dining restaurant, under the hands of executive chef Michélle Theron, brings a contemporary and creative interpretation of South African and Russian recipes to create culinary art. Expect dishes like asparagus, fennel and pear salad served with blue cheese; octopus terrine with salsa verde; borscht (beetroot soup) served with a quail egg; smoked fish and pampushki (fried potato balls) with flavours of pickled fish; and a Fabergé-inspired creation for dessert with white chocolate filled with a light mousse and served with passion fruit sorbet. Headed up by chef Rikku Ó’Donnchü and Warwick King, this one-of-a-kind restaurant opened in November 2018 to much acclaim. The 16-course meal begins with a bread course called ‘Not an ashtray’ and escalates to a bubbling coral reef platter, an ethical fois gras duck’s egg, a cauli-cheese course and ends on a beetroot candy helium balloon. It’s a theatrical treat – in flavour, presentation and experience. Vadas Smokehouse on Spier Estate showcases chef PJ’s ease with big flavoured-dishes and his wife Tara’s skill at creating beautifully furnished, comfortable spaces. Multiple rooms, decks, outside tables and counters provide ample nooks and leafy spaces for business meetings or gatherings, where you can order roasted meats and locally sourced vegetables with layers of flavour and innovative touches like snappable crispy chicken skin. Don’t forget to take home a baked good – PJ’s famous pasteis de nata, if there are any left. This selection comprises all the Stellenbosch restaurants that made the cut for the 2019 Eat Out 500, the list of best restaurants in the country as rated and reviewed by our panel of critics for the 2019 edition of Eat Out magazine (on sale now). But we know there are many more great spots in the area. Please tell us about your favourites in the comments below. Visited any of these spots lately? Remember to review your experience on our free app.